The Cuban composer Leo Brouwer (*1939) is protagonist and inspiration behind the musical union of internationally known guitarist Carlos Barbosa Lima and the Latin Grammy-winning Havana String Quartet. Leo Brouwer’s two quintets for guitar and string quartet, several pieces for solo and duo guitar and the world premiere recording of his 5th String Quartet will delight listeners with their compositional variety and the technical and interpretive strength of their performances. Havana-based Leo Brouwer, composer, guitarist, pedagogue and orchestra conductor, is one of the most important musicians in today’s international classical music scene. Beginning his guitar studies with Isaac Nicola, he continued his musical education at New York's Julliard School studying composition with Vincent Persichetti, Stefan Wolpe, IsadorePreed, J. Diemente and Joseph Iadone. Since the 1950’s, Brouwer has created a remarkable addition to the classical guitar repertoire, and his works for guitar are performed more often than those of any other living composer. He is also a recognized composer of orchestra and choral works, chamber music, modern ballet, and as many as 60 film scores. He is an honorable member of UNESCO and has received over 200 awards over his outstanding career. These include the Latin Grammy for Best Classical Music Album in 2010, and a Latin Grammy nomination for Best Contemporary Classical Composition for his String Quartet # 4 in 2012 - both for the prior Havana String Quartet / ZOHO release of his first four String Quartets and the String Trio (ZOHO ZM 201108). Beatlerianas is a suite of seven Beatles song arrangements, heard for the first time on this album in this version for guitar and string quartet. Originally this work was conceived for guitar and string orchestra at the bequest of Japanese guitarist Ichiro Suzuki in 1985. The string orchestra version was entitled "From Yesterday to Penny Lane" and was previously recorded by Carlos Barbosa-Lima in 1997, now out of print. Although one might think that it is difficult to expect much from tunes that are so commonly covered, Brouwer’s rendition is a work of art, as the piece is overflowing with a variety of influences, textures and techniques. The guitar and string quartet are in constant dialogue sharing harmonic combinations, colors and melodies. 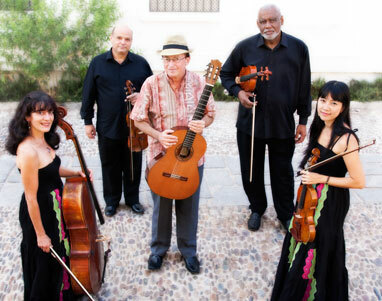 The Havana String Quartet played the world premiere performance of the 5th String Quartet on November 16, 2012 in Córdoba, Spain. The Leo Brouwer solo guitar compositions chosen by Barbosa-Lima for this recording include Cantilena de los Bosques which is dedicated to Italian guitarist Roberto Fabbri. Paisaje Cubano Con Fiesta is a recent addition to Brouwer's continuing “sonorous exploration” of Cuban landscapes begun in 1984. Zapateo comes from an earlier period in Brouwer's compositional evolution (1973) and shows a clear example of the influence of Spanish popular music. Duo Micropiezas # 1 - 4 were written from 1957-8 as a necessary addition to the repertoire for the duo Leo Brouwer formed with Jesús Ortega. Duo Micropieza # 5 was later added in 1958. These pieces, a polytonal tribute to composer Darius Milhaud, are wittingly and masterfully constructed, using elements of the Frenchman’s harmonic vocabulary and Brouwer’s counterpoint and rhythmic complexity. Brouwer cites the theme of a conga in the 3rd and reworks an anonymous ancient Cuban counter dance in the 4th. These pieces, along with the Guitar and String Quintet are the first in Brouwer’s expansion into chamber music. The Quintet for Guitar and String Quartet was written in 1957. As with most of his early works, this quintet displays Brouwer’s heritage with clear Afro-Cuban influences and rhythmic presence. Not only that, in its three movements, the teen-age composer displays his complete dominion over guitar technique and sonority. The guitar part leans more in the direction of soloist and Brouwer’s resonant writing ensures the guitarist a high profile. The opening Allegro movement is perhaps the most harmonically adventurous. Favoring chords built on the interval of a fourth not only suits the guitar; it instead lends an openness and mobility to the harmonic language. The tranquil central Andante features more lush harmonies.Its melodic theme is again rewoven in his piece for solo guitar Cantilena de los Bosques, also featured on this album. The closing Vivace has ajaunty swing thanks in part tocompound time but more so due to the central role of those bluesy harmonies. From 1974 - 78, Barbosa-Lima took a teaching position at Carnegie Mellon University in Pittsburgh, PA. During this time, he became a musician to whom many important composers dedicated their works such as Ginastera and Mignone. In 1981, Barbosa-Lima moved to New York City and took a teaching post at the Manhattan School of Music. It was here that he performed and recorded regularly with Charlie Byrd and Antônio Carlos Jobim. He has a notable discography, recording several albums for Concord Records in the 1980s and 90s. Since the year 2003, Barbosa-Lima recorded exclusively for the ZOHO label, both in guitar solo repertoire and in highly acclaimed collaborations with major Brazilian and Latin Jazz musicians, including Eddie Gomez, Dafnis Prieto, John Benitez, Hendrik Meurkens, Duduka Da Fonseca and Nilson Matta. Larry Del Casale is a New York area based classical guitarist, music educator, and a graduate of the Mannes College the New School for Music. He has been a frequent guitar duo and international touring partner with Carlos Barbosa-Lima over the past several years. Additionally since 2003, he has frequently acted as duo partner and producer at Mr. Barbosa-Lima's highly acclaimed Weill Recital Hall at Carnegie Hall performances in New York. 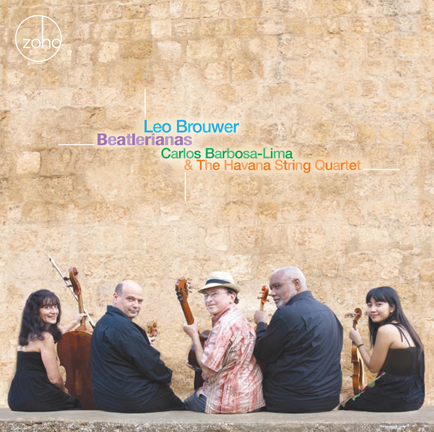 The Havana String Quartet was founded in 1980 on the initiative of Leo Brouwer. The group is known for its unique, cross-cultural repertoire, and its accomplishments in a variety of musical styles. The HSQ has collaborated with guitarists Eliot Fisk, Pepe Romero and Javier Perianes, Afro-Cuban jazz legend Orlando “Cachao” López, Cheik Lo, singer Ibrahim Ferrer, the Buena Vista Social Club, Magic Malik, and Cuban percussionist Miguel “Angá” Diaz. The HSQ's particular strength and talent has been dedicated to Latin American composers such as Revueltas, Ginastera, Villa-Lobos, Manuel Enríquez , Garrido-Lecca and of course Leo Brouwer. In 2009, the HSQ was invited for the first time to the 7th Universe of Sound Festival in Moscow, Russia, where its interpretations of Brouwer and Latin American popular music was received to great public acclaim. The HSQ has won three important awards which demonstrate that it is one of the most active and prestigious chamber groups in Cuban music: the Interpretive Mastery Award at the Havana Chamber Music Festival, 1987, Best Chamber Music Album at the CUBADISCO Festival, Havana, 2010, and the LATIN GRAMMY, 2010, for Best Classical Music Album. Guitar and strings repertoire recorded at the Teatro Gongora, Córdoba, Spain, September, 2012. Engineer, mixes, edits and mastering : Amado del Rosario. Producer: Amado del Rosario. Guitar solo and duo repertoire recorded at The Loft Studios, Bronxville N.Y. in September, 2012; Engineer: Al Hemberger. Photography: Gabrielle Friscia. Package design: Jack Frisch. Executive producer: Joachim “Jochen” Becker.